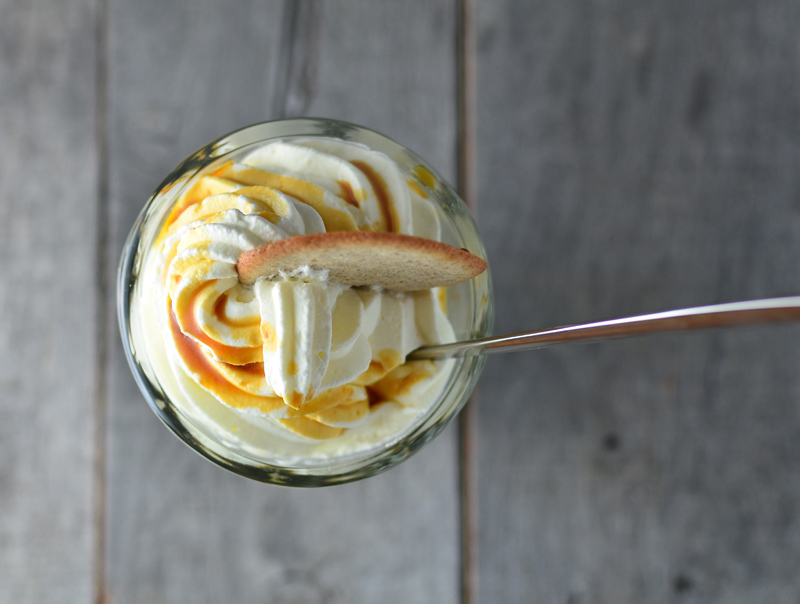 After the recent birch syrup pie, here’s a second serving of kefir ice cream with birch syrup — but in a totally different format, and with the very peculiar flavor of sea-buckthorn. 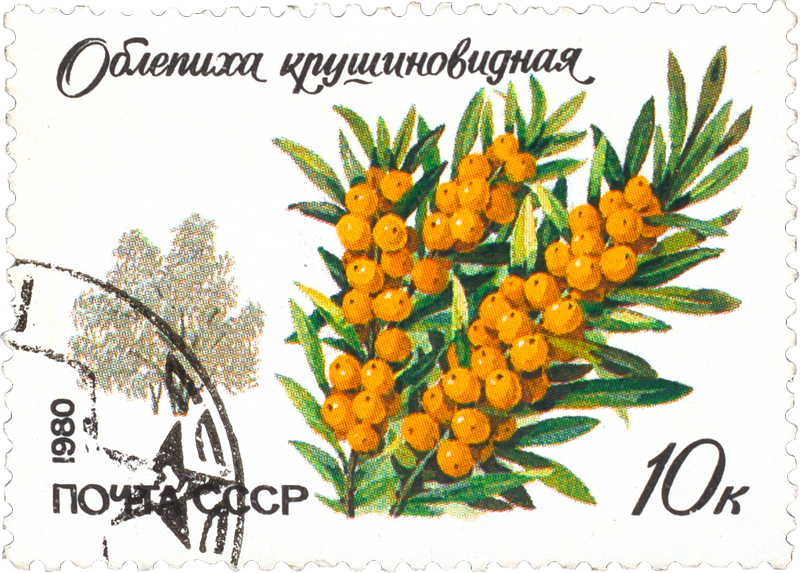 Sea-buckthorn is an orange berry found throughout Europe and Asia, with an exceptionally high content of vitamin C and carotenes. While it’s sometimes used in pies, jams, and alcoholic beverages, its juice remains the most popular food product. The taste is quite hard to describe. The plain juice is very acidic and intense; really somewhat unpleasant. However, it becomes more palatable when diluted and mixed with sugar. It’s certainly like no other berry I’ve ever tasted. In western Europe, it is largely confined to sea coasts where salt spray off the sea prevents other larger plants from outcompeting it, but in central Asia, it is more widespread in dry semidesert sites where other plants cannot survive the dry conditions. In central Europe and Asia, it also occurs as a subalpine shrub above tree line in mountains, and other sunny areas such as river banks. I decided to focus on the Baltic connection, specifically with Estonia in mind. Rye and birch are two other defining ingredients of Estonian cuisine, and rounding them up with some of my kefir ice cream, I had all the elements for a great sundae. The rye cake and tuiles bring much-needed textural variations to the dessert. The quick cake recipe, which involves pouring batter from a siphon and cooking it in a microwave, is adapted from ChefSteps‘ class on whipping siphons. The result is amazingly airy. If you live in the US, it’s going to be challenging to find sea-buckthorn juice. It tends to be marketed as a health supplement rather than as foodstuff. This place sells a “Sea Buckthorn Liquid Supplement”, but its mixed with several other juices and some scary “natural” flavors so I don’t promise anything. Several Canadian websites sell pure sea-buckthorn juice, like this one, but when you factor in shipping fees you’re faced with an expensive proposition. If you live in France, you can get this affordable organic juice in stores or online (some sites will also ship it to other European countries). In a bowl, whisk the eggs and sugar to a pale ribbon. In a small saucepan, bring the heavy cream to a boil, and whisk in the milk powder. Pour slowly over the egg mixture, beating constantly. Return to the saucepan, and cook over very low heat to 85 C / 185 F, stirring constantly. Remove the custard from the heat, and pass through a chinois into a container set over ice water. Let cool, then refrigerate for at least 4 hours. Mix in the kefir and lemon juice, then chill the mixture in the freezer for 30 minutes. Churn in an ice cream maker, following the manufacturer’s instructions. Transfer to the freezer for at least 12 hours before serving. In a bowl, mix the egg and egg yolk with about 1/3 of the sugar to a ribbon consistency. In a small saucepan, mix the sea-buckthorn and orange juices with the remaining sugar and bring to a boil. Pour the juices over the egg mixture while whisking, then return to the saucepan, and cook over medium heat to 85 C / 185 F.
Add the heavy cream, then strain into a bowl set over ice water, and let cool. Transfer to a plastic container, and refrigerate. Place the kefir, peanut oil, egg white, egg yolk, sugar, and salt in a blender, then process on medium speed until thoroughly mixed. Pour the mixture into a half-liter siphon, close, add 2 cartridges of N2O, and shake vigorously. Line up 6 paper cups — any size will do — and dispense 45 g of batter per cup using the siphon. (How do you know when you’ve got 45 g of batter? You weigh each cup on a scale!). Microwave the cups on high for 38 seconds (assuming you use a 1100 W microwave). Flip the cups upside down, and let cool for 2 minutes. Poke small slits with a knife in the bottom of each cup to let the steam escape, then slide the knife around to unmold each cake. Reserve in a plastic container. In the bowl of an electric mixer fit with the paddle attachment, beat the butter until smooth. Slowly mix in the rye flour, confectioner’s sugar, and salt on low speed. Add the egg whites, and beat for 2 more minutes. Cover and chill for 2 hours. Place a Silpat on a baking sheet, and spray with canola oil. Prepare a paper template for 5.5 cm diameter discs. Proceeding in batches, use the template to spread the batter into discs on the Silpat. Bake for 5-6 minutes in a 200 C / 400 F oven, then immediately remove from the Silpat using a spatula, and let cool. Repeat until you run out of batter. As you can imagine, the life span of a piece of paper applied to a greased surface and repeatedly covered in batter is pretty short so you may need to make more than one template. You can also buy tuile templates made of metal or plastic, but they don’t come cheap. Try to avoid, unless you plan to make tuiles for a living. Add the xanthan gum and the superfine sugar, then switch to high speed, and whip the cream to hard peaks. Transfer to a piping bag fit with a decorative tip, and reserve in the refrigerator. Alternatively, the cream can be made in a siphon with half a cartridge of N2O. Chill 8 sundae glasses in the freezer for at least 20 minutes. 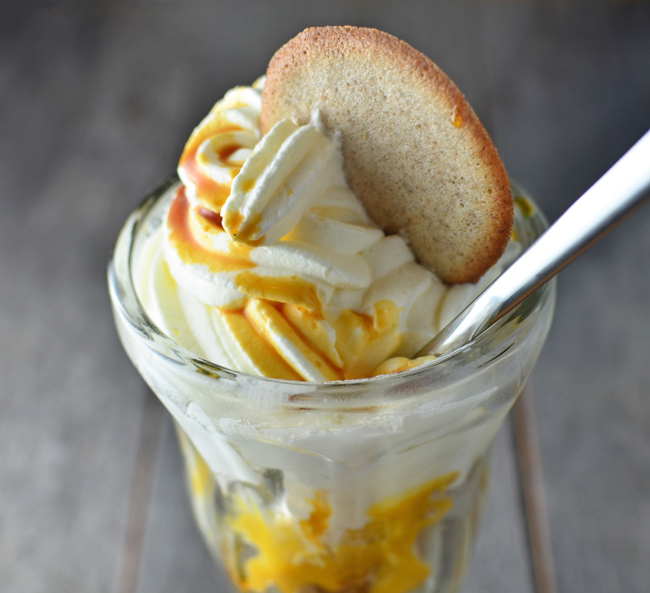 Assemble each glass in layers as follows: 1 tbsp sea-buckthorn sauce, 1 scoop kefir ice cream, 1 1/2 crumbled rye tuiles, 1/2 crumbled rye cake, 1 tsp birch syrup, 1 tbsp sea buckthorn sauce, 1 scoop kefir ice cream, 1 1/2 crumbled rye tuiles, 1/4 rye cake, whipped cream, 1/2 tsp birch syrup. But feel free to experiment with different layers and proportions! 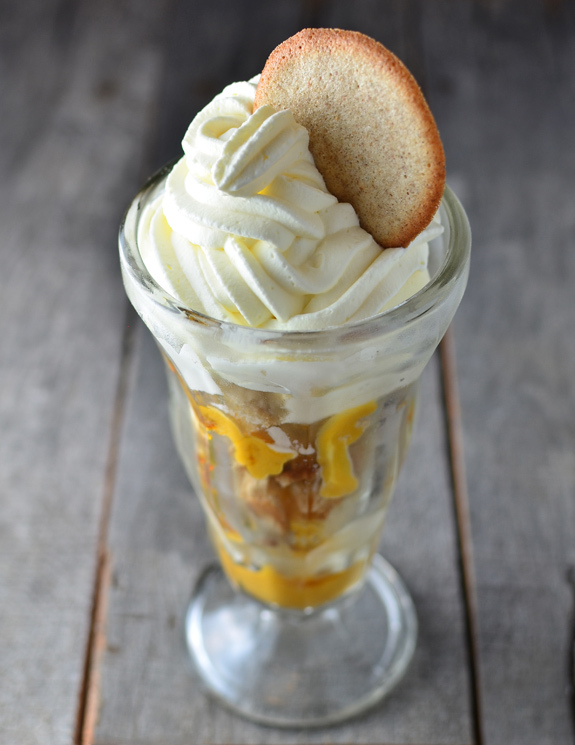 Decorate each sundae with a whole tuile, and serve immediately. This recipe is a 2-in-1 kind of deal. Not only does it produce a delicious flavored vodka, it also leaves you with pieces of rhubarb you can serve with tea or use to make a cake, such as a babka. Originally from China, rhubarb was transported along the Silk Road starting as early as the 14th century. As the usual route lay through Russia, it became known as “Russian rhubarb”. Nowadays, it’s especially popular in Northern Russia and in the Baltic states — you’ll find a rhubarb bush in every Estonian vegetable garden. Check out the countless rhubarb recipes from Estonian blog Nami-Nami. You can use any variety of rhubarb you want, but cherry red rhubarb will give you the brightest red color. Place the rhubarb in a saucepan with the sugar and white wine, and let rest for 4-5 hours. Bring the rhubarb to a boil, stirring regularly, then boil for 1 1/2 minutes. Transfer to a sterilized pint jar, gently stir in the vodka, seal and process in a 200 F water bath for 15 minutes. Store in a cool place for at least 1 month. In Nordic countries as well as Estonia, salmon is commonly cured in salt, sugar and dill, and called gravlax − graavilõhe in Estonian. By adding cranberry juice to the curing mix, you can impart a subtle red berry note to the fish and turn the flesh a bright red color. In a bowl, combine the sugar, salt, peppercorns, dill and cranberry juice. Find a dish just large enough for the salmon fillet, and coat the bottom with some of the marinade. Place the fish skin side down, then spread the rest of the marinade on the fillet. Cover with plastic wrap and refrigerate for 48 hours. Every 4 hours or so, coat the fillet with the marinade using a spoon. Rinse the fillet under cold water and pat dry with paper towels. Wrap in plastic and refrigerate. The salmon can be kept for about a week. To serve, cut very thin slices lengthwise using a fish or boning knife.